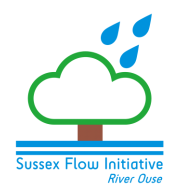 Sussex Flow Initiative (SFI) is a Natural Flood Management (NFM) project based in the River Ouse catchment in East Sussex. ​SFI was formed in 2014, as a partnership between the Woodland Trust, Sussex Wildlife Trust and the Environment Agency. It is further supported by funding from Lewes District Council. SFI works with landowners, local people and others to investigate, promote and create natural features designed to slow and store water in the landscape and to help reduce flood peaks. We aim to deliver multiple benefits for people and wildlife, as well as to show how NFM can be used to support traditional flood management methods to help reduce flooding.